The Tropicana Plage de Ramatuelle beach-restaurant reflects the spirit of LA.TARTE.TROPÉZIENNE where you find a friendly, tasteful, family atmosphere… pure and simple ! The Tropicana La Plage restaurant, decorated in white and red, welcomes you to its large shady terrace where every table is sea-facing. Our talented head chef, Eric Santalucia, originally from Toulouse and former student of the Chef Alain Ducasse Cooking School for around ten years, invites you to experience an explosion of regional flavours reinvented in his own style. 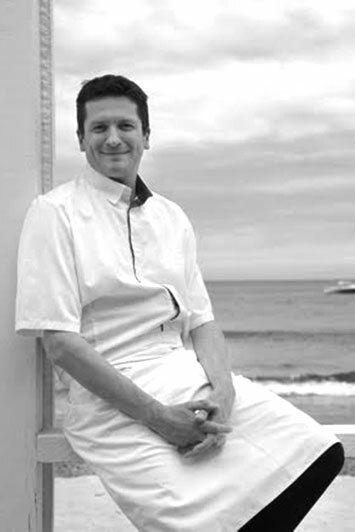 His Mediterranean recipes, using regional produce, selected from well-known producers, such as Yann Menard, market gardener from Cogolin, create a fabulous menu with southern tones: Squid Provençale-style, Stuffed Vegetables, Artichokes à la Barigoule, Marinated Grilled Squid, etc. And let’s not forget the traditional fish of the day. When it comes to dessert, our specials are also extremely regional: LA TARTE TROPÉZIENNE in all shapes and sizes: Baby Trop’ in various flavours, Tarte Tropézienne, Apricot Pastry, and even Chocolate-Tea “Crousti-Fondant” as well some great classics of French patisserie, such as Lemon-Meringue Tart, etc. Service included. Mastercard, Visa and American Experess accepted.